Each month I will describe sights of interest in the night skies of South Carolina. These sights will be broken down into three sections; what you can see with the naked eye, with binoculars, and with a small telescope. 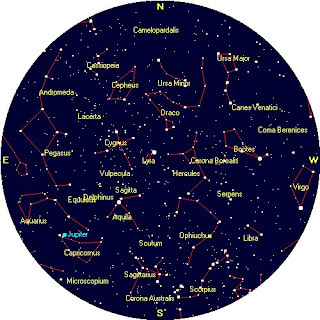 The best time to view the night sky is at and around the times when the Moon is not visible, what is known as a New Moon; which will occur this month on August 20th. For August, your best viewing nights will be from August 12th through August 25th. The Star chart below is set for Florence, SC on August 15th at 10 pm. Update: Our Sidewalk Astronomy Program continues each month. On July 3rd we were in Hartsville at the Emmanuel Baptist Church 4th of July celebration. Because of the event timing and fireworks, we spent most of the time with our solar telescope. 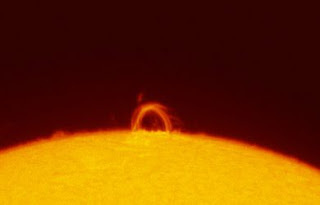 Since the Sun is very quiet right now, we were very pleased to see three solar prominences. One was especially exciting because it formed a loop. The following image is similar to the sight we saw that evening. After the Sun set, we brought out a 120mm refractor, and let people enjoy the view of the waning gibbous Moon, until the fireworks began. In general, it was a good evening for all. Without question, Jupiter will be the best planetary target for this year. The reasons are as follows: First, it is the largest planet, making it easier to see as a disk. Second, although Jupiter is cloud covered, its clouds exist as beautiful bands, containing swirling features, and hurricane like circular storms. Third, because of its rapid rotation, you should be able to see features move over a period of an hour or so. Fourth, its four major (Galilean) moons can be seen to change each night as they spin around Jupiter. Fifth, because of its size and distance, you can enjoy viewing this planet using simple telescopes; even seven power binoculars will suffice to see its four moons! Jupiter makes its return to our night sky, rising in the southeast. If you observe early in the month, and early in the evening, Jupiter will likely be too low in the sky, and viewing will be affected by atmospheric haze. The best date for viewing any planet is usually at opposition, which is when the planet is directly opposite the Sun as viewed on the Earth. Opposition will occur on August 14th. 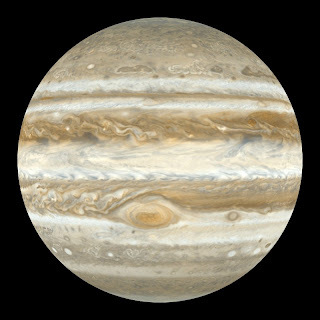 However, to maximize your chances for a spectacular view of the planet that night, you should view Jupiter at or about 1 am. The reason being, is at that time Jupiter will reach its highest point in the sky, thereby allowing you to view through the thinnest layer of atmosphere. Actually, many people may prefer waiting to view Jupiter in September and October when it is higher in the sky earlier in the evening. I will discuss Jupiter further next month. 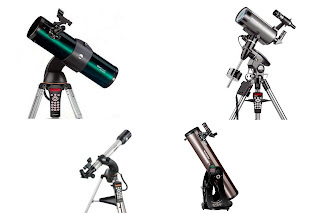 A question was posed to me just recently concerning whether or not one should purchase a GoTo telescope, so I decided to discuss it here. A GoTo telescope is one that is linked to a computerized controller. Once the telescope is aligned, you simply type in your target, click goto, and the telescope will find the target and track/follow it for as long as you want. I own a GoTo scope (ETX-125), shown below. Some other GoTo telescopes are shown below. 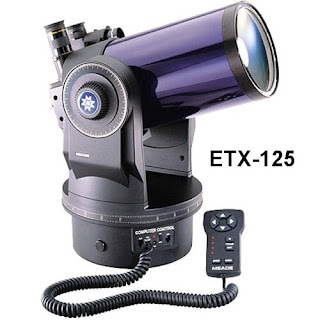 GoTo’s are quite popular with catiotropic scopes, such as is the ETX-125, however, they can also be used with standard Newtonian reflectors, and with refractors. A GoTo type controller can be used on a Dobsonian reflector, but the nature of a Dob will not allow for motorized tracking. So this is great, right? No more searching through star charts, trying to learn the constellations, fumbling with finding scopes (which is up/down, left/right?). Want to see the Hercules Cluster, just type in its name, or type in M13, and the telescope finds it for you! Want to see the Orion nebula/M42 this month, just type it in, and the controller tells you it is not visible this time of year; luckily, it will not laugh at you for asking. The question about GoTo scopes was asked by a beginner amateur astronomer, and I have still not given him a definitive answer. Beginners sometimes have a lot of trouble finding some wonderful celestial objects such as the Ring nebula (M57 or the Whirlpool galaxy (M51). These two objects would be found in seconds with a GoTo telescope. So why has my ETX-125 GoTo been collecting dust for several years? If you only wish to enjoy viewing the vast number of celestial wonders, then perhaps you should invest in a GoTo scope. However, if you want to find your way around the night sky, then you have to do it the “hard” way with charts and diligence and time. Note: If there was a computer that you could set up in the woods, type in a name of any bird, and it would find it for you, would bird watching still be enjoyable. I have no answer. So I posted the question asked of me, but I will leave it up to each reader to decide to GoTo or not GoTo. Naked Eye Sights: Expect someone this month to ask you “What is that bright star?” at which time you will explain that is not a star, but is the planet Jupiter. Meteor Shower: Check out the famous Perseids meteor shower late night on the 12th, and early morning on the 13th, but it may be quite lessened by the presence of a 55% gibbous Moon. Binocular Sights (7 to 10 power): Watch the four Galilean moons of Jupiter as they change positions each night. Telescope Sights (60-100mm): Begin your enjoyment of the planet Jupiter, marking your calendar for the view at opposition on the 14th.